The northwest corner of the Finger Lakes Region, Monroe County sits on the southern shores of Lake Ontario and is home to Rochester, the third largest city in New York State. 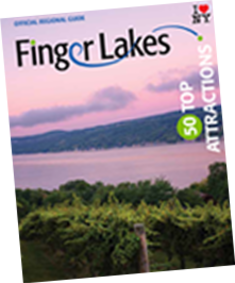 It is considered the cultural capital of Upstate New York with world-class music, theatre, dance and visual arts. The Memorial Art Gallery (MAG)&apos;s permanent collection of more than 12,000 pieces has been called the best in the state outside of New York City. Geva Theatre brings in the country’s top actors, directors, designers and writers to put on professional performances of national recognition, making it the best attended regional theatre in the Northeast. History is rich in Rochester, with the home of Susan B. Anthony and George Eastman, and final resting place of abolitionist Frederick Douglass. Relive the historic moments of legendary women’s suffragist at the National Susan B. Anthony Museum & House and stand in the front parlor where she was arrested for voting in the 1872 election. Learn about the history of photography and motion picture film at the George Eastman Museum, the world’s oldest photography museum. On site sits the 500-seat Dryden Theatre which shows over 300 films a year – all in their original formats. Feel like a kid as you explore The Strong National Museum of Play, where you can walk down the famous Sesame Street, delve into your favorite storybook in Reading Adventureland or view classic games in the National Toy Hall of Fame. The Seneca Park Zoo is the place to see African lions and elephants, North American river otters, as well as snow leopards and red pandas in their Cold Asia exhibit. When you’re ready to up the adventure, head to Seabreeze Amusement Park for big thrills, classic rides and a refreshing waterpark. But these are just the beginning - with over 75 family-focused attractions within one hour of Rochester, there are plenty of places to make memories and have fun! World-class events and over 140 festivals take the stage in Monroe County. The signature Lilac Festival in May celebrates the largest collection of lilacs in North America - 1,200 lilac bushes displaying 500 varieties of the flower – along with festival entertainment, activities and fare. In June, the nine-day CGI Rochester International Jazz Festival draws in thousands of visitors from across the world to enjoy over 300 shows and performances across 20 different venues. Be sure to bring your taste buds for Monroe County’s buffet of traditional and contemporary cuisines. Diverse ethnic flavors, charming cafes, upscale fine dining and a booming craft beverage scene make this a foodies paradise. Then there’s the famed "Garbage Plate" – macaroni salad, French fries and a choice of meat, topped with hot meat sauce – you must try this ‘delicacy’ at least once.